Protein is a macronutrient. Unlike a "micronutrient," the body needs it in larger amounts. It is utilized for muscle growth, cell regeneration and to promote a healthy immune system. When it is digested in the body, a waste product called "urea" gets produced. When the kidneys are not functioning properly, urea can build up in the system and cause fatigue and a loss of appetite. To help remedy this problem, you can eat specific foods to lower your protein levels. Meats are a complete protein, meaning they have all the essential amino acids present that are crucial for functioning. Being that they are complete, they should be eaten, but not in huge amounts. For example, meats can be sliced thinly, then placed on a sandwich that is piled high with vegetables. Examples of these meats are roast beef, turkey, ham and chicken. Eggs are another food that is high in protein. To lower your levels, eliminate the yolks and have just the egg whites. There is also an egg replacer you can get in powdered form that has virtually no protein at all and can be used in baked goods (see Resources). 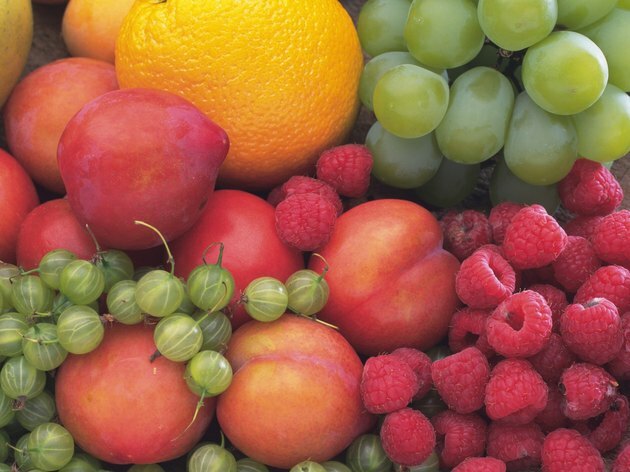 Fruits are high in water content; they have a lot of fiber, and they are also chocked full of vitamins and nutrients. One thing they are not high in is protein, and they can be eaten to lower your levels. Some examples are apples, bananas, grapes, pears, peaches, pineapples and figs. Vegetables are along the same lines as fruits. They are high in water content and fiber, and they have phytonutrients in them. Some vegetables are higher in protein than others, such as broccoli, cauliflower and baby spinach. Low protein vegetables include kale, collards, carrots, squash, sprouts, celery, cucumbers, tomatoes and all forms of lettuce. Whole grains are high in fiber, and they have preventive properties when it comes to avoiding cancer. They are also high in B vtamins, and they have a moderate amount of protein. Some examples are oatmeal, oat bran, wheat bran, all forms of rice and barley. Breads and cereals are also made from grains. The whole wheat and whole grain versions will be higher in protein than white bread and refined cereals. To lower your protein levels, stick with white bread, white bagels, white pizza crusts and refined cereals. Pasta is another type of grain that comes from semolina wheat. Eat the varieties that are not whole wheat or whole grain so you take in less protein.